1. The windlass cablelifter brakes must be able to control the running anchor and cable when the cablelifter is disconnected from the gearing when letting go'. Average cable speeds vary between 5 and 7 m/s during this operation. 2. The windlass must be able to heave a certain weight of cable at a specified speed. This full load duty of the windlass varies and may be as high as 70 tonne; figures between 20 and 40 tonne are not unusual. Commonly the load is between 4 and 6 times the weight of one anchor. The speed of haul is at least 9m/min and up to 15 m/min. 3. The braking effort obtained at the cable lifter must be at least equal to 40% of the breaking strength of the cable. Most anchor handling equipment incorporates warpends for mooring purposes and light line speeds of up to 0.75 to 1.0 m/s are required. The conventional types of equipment in use are as follows. This equipment is self contained and normally one electric or hydraulic motor drives two cablelifters and two warpends. The latter may not be declutchable and so will rotate when the cablelifters are engaged. There is some variation in the detailed design of cablelifters and in their drives. Figure 13.4 shows a typical arrangement. 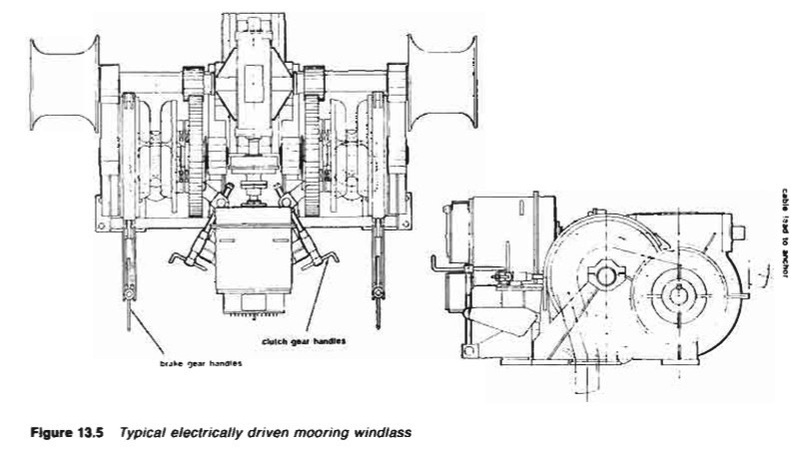 Due to the low speed of rotation required of the cablelifter whilst heaving anchor (3—5 rev/min) a high gear reduction is needed when the windlass is driven by a high-speed electric or hydraulic motor. This is generally obtained by using a high ratio worm gear followed by a single step of spur gears between the warpend shaft and cablelifters, typically as shown in Figure 13.5. Alternatively, multi-steps of spur gear are used. With this type of equipment the driving machinery is situated below the deck and the cablelifters are mounted horizontally, being driven by vertical shafts as shown in Figure 13.6. In this example a capstan barrel is shown mounted above the cablelifter (not shown) although with larger equipment (above 76 mm dia. cable) it is usual to have only the cablelifter, the capstan barrel being mounted on a separate shaft. This arrangement utilizes a forward mooring winch to drive a windlass unit thus reducing the number of prime movers required. 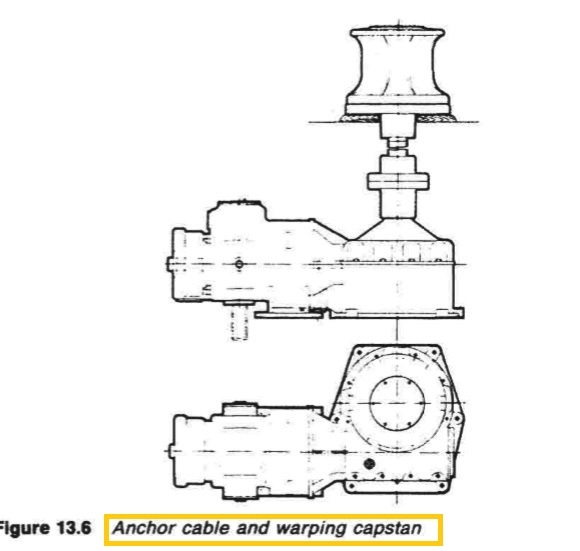 The port and starboard units are normally interconnected, both mechanically and for power, in order to provide a stand-by drive and to utilize the power of both winches on the windlass should this be required. As windlasses are required for intermittent duty only, gearing is designed with an adequate margin on strength rather than on wear. 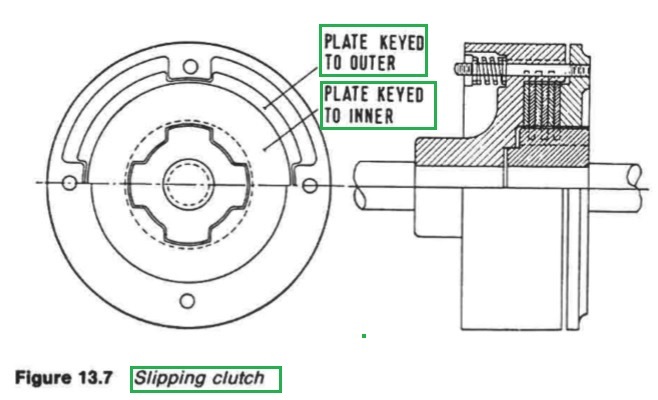 Slipping clutches (Figure 13.7) may be fitted between the drive motors and the gearing to avoid the transmission of inertia in the event of shock loading on the cable when, for example, the anchor is being housed. Windlasses are normally controlled from a local position, the operator manually applying the cablelifter brake as required to control the speed of the running cable, and whilst heaving anchor the operator is positioned at the windlass or at the shipside so that he can see the anchor for housing purposes. 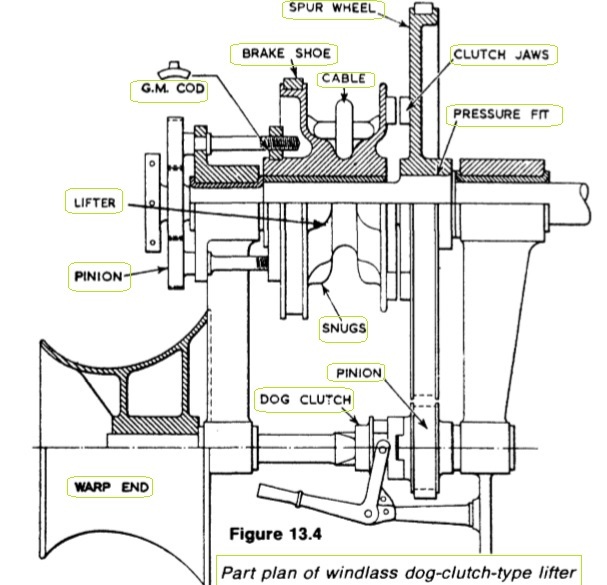 It is quite feasible, however, to control all the functions of the windlass from a remote position. The spring applied cablelifter brakes are hydraulically released, and to aid the operator the running cable speed and the length paid out are indicated at the remote position during letting go. The cablelifter can also be engaged from the remote position so that the anchor can be veered out to the waterline before letting go or heaved in as required. The windlass is in the most vulnerable position so far as exposure to the elements is concerned and maintenance demands should be an absolute minimum. Normally primary gearing is enclosed and splash lubricated, maintenance being limited to pressure grease points for gunmetal sleeve bearings. However, due to the large size of the final of the bevel or spur reduction gears, and the clutching arrangements required, these gears are often of the open type and are lubricated with open gear compounds.